**UPDATE: I’ve finally completed my instruction video!! Click here to see it on my YouTube channel! 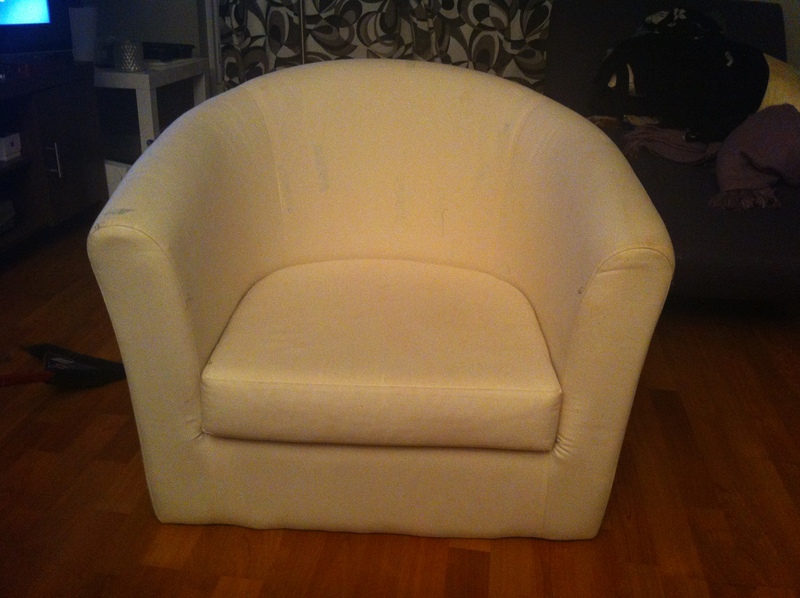 Many years ago, I bought myself a Tullsta armchair from Ikea. The cream-coloured chair served me well, but I was toying with the idea of jazzing it up a bit. I’m not one for slip covers (they are too clumsy-looking and expensive for my taste) and just adding a funky cushion wasn’t enough, so I decided to reupholster it. I scoured online for local upholsterers and emailed RFQs to them. 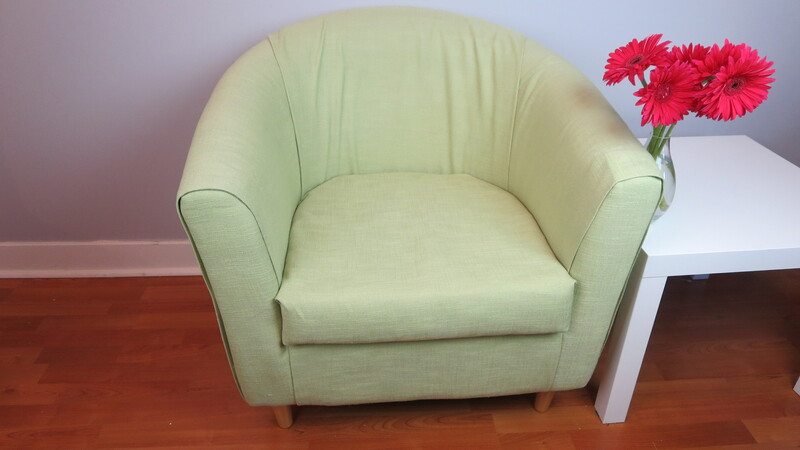 I was told that for the size of my chair, the labour cost of upholstery would be approximately $385 plus the cost of fabric. Seeing as I paid a mere $96 for my Tullsta back in 2007, the idea of paying about 4 times the price was preposterous, let alone the cost of fabric. The idea of professional reupholstery was instantly squashed. But my problem remained – I still had a neutral chair. I decided to take matters in my own hands. I’m a DIY-er – I’ve installed my own recessed light fixtures, hung my pendant lights, used my hammer drill to create holes in my cement-back walls – I could upholster my own chair, or at least attempt to. So that’s what I did. I headed over to Fabricland, got myself some supplies and came back home to tackle my project. Naturally, when you think of upholstery, you think of some degree of sewing with a machine. This wasn’t an option for me because for one, I don’t have a sewing machine, and secondly, sewing involves measuring and I hate measuring, so sewing is out. There were some parts where I sewed by hand, but it was very minimal, which worked well for me. I started by taking the seat cushion out and working on the front of the arms. This is where the hand-sewing came in. I laid the fabric against the arms and pinned to set it temporarily. I hand-sewed the edges where I folded it over the arms. This is the only part that I sewed. At the lower part of the front of the chair, I cut a piece of fabric that would fit well (I didn’t measure it, I just laid it against it first to get a sense of how big a piece I should cut. That what I did throughout the entire process, actually). I folded it on its side and created a clean seam. I stapled it on the inside seat area of the chair. 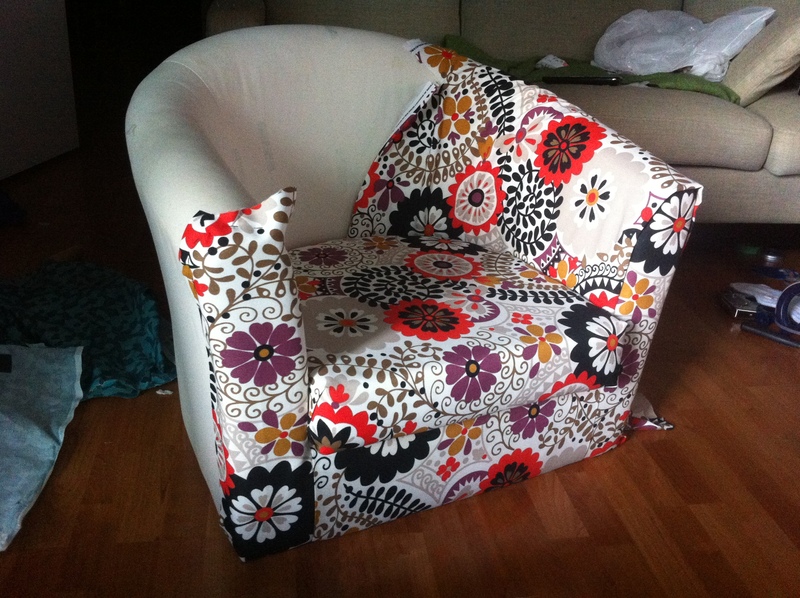 I also turned the chair over and stapled the fabric on the bottom of the chair, while holding it nice and taut. Now it was time to work on the side of the chair. I took one long piece and draped it from the inside to the outside of the chair. That sounds nice and simple, but that was a pretty tedious exercise. I had to make sure that fabric was properly lined up on each side. Similar to the step before, I stapled this piece of fabric on the inside of the chair, flipped it over and stapled it on the bottom of the chair. Where the side fabric met the frontal arm fabric, I took a pieces of the heat-activated tape and put it under the side fabric, and pressed it with a hot iron. There’s no picture for this, but I affixed the fabric to the seat cushion of the chair with the heat-activated tape as well. I continued the process on the other side. At this point in time, life got a little hectic for me, so this hack was placed on hold. 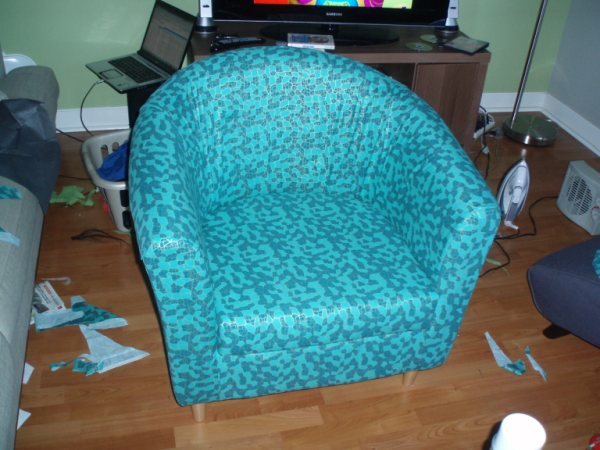 During that time, I decided to paint my den, the room that this chair was to go in, in a cool, crisp colour, which clashed horrendously with the warmth of the fabric, so I didn’t complete the project. Plus, I wasn’t sure if the flower power motif was right for me. 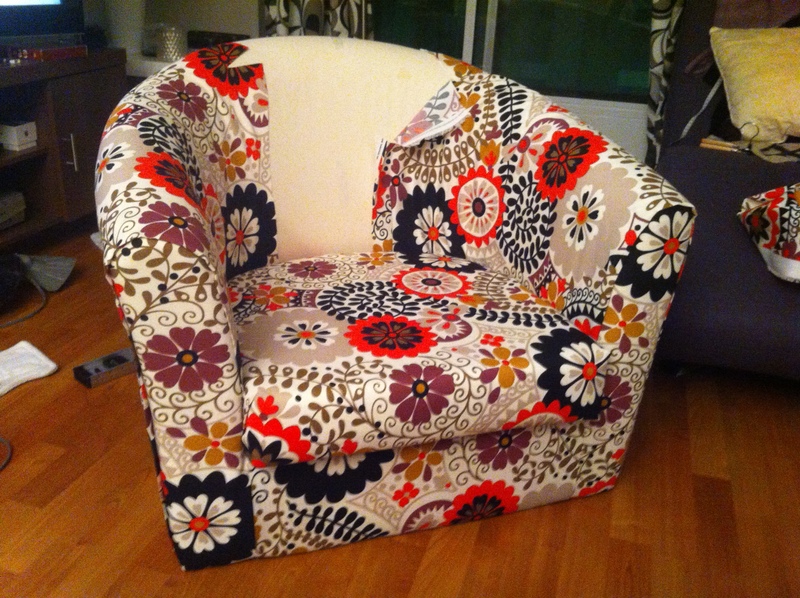 I’m on the lookout for some new fabric, so I hope to have a newly-styled chair in the next few months. Try to get your fabric on sale (and every other product you ever buy). If you mess up, you won’t feel as bad. I bought my fabric for only $6 per metre. Use fabric that is either solid or has a busy pattern that is not going in one direction. This will minimize the look of imperfections. There is no way I could have done this project in a striped fabric, it would have been a hot mess. 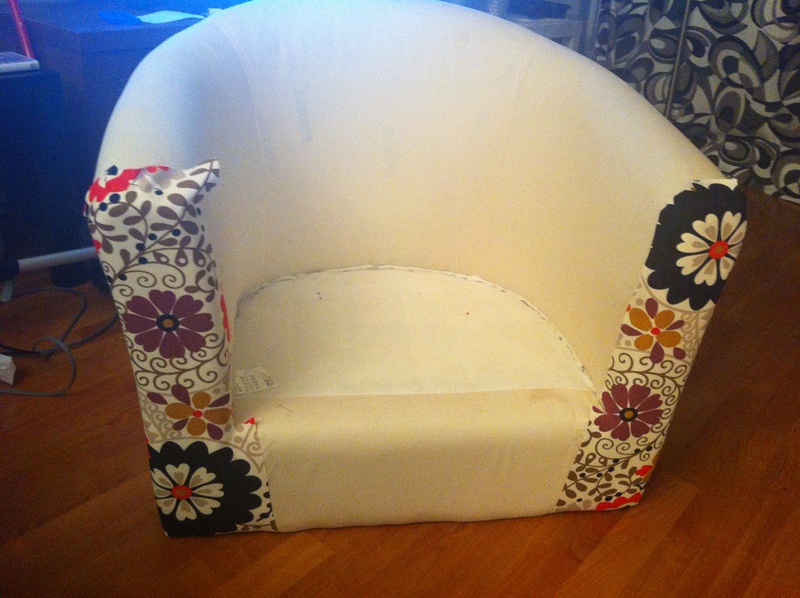 Use 2 or 3 pieces of fabric for the middle section of the chair. 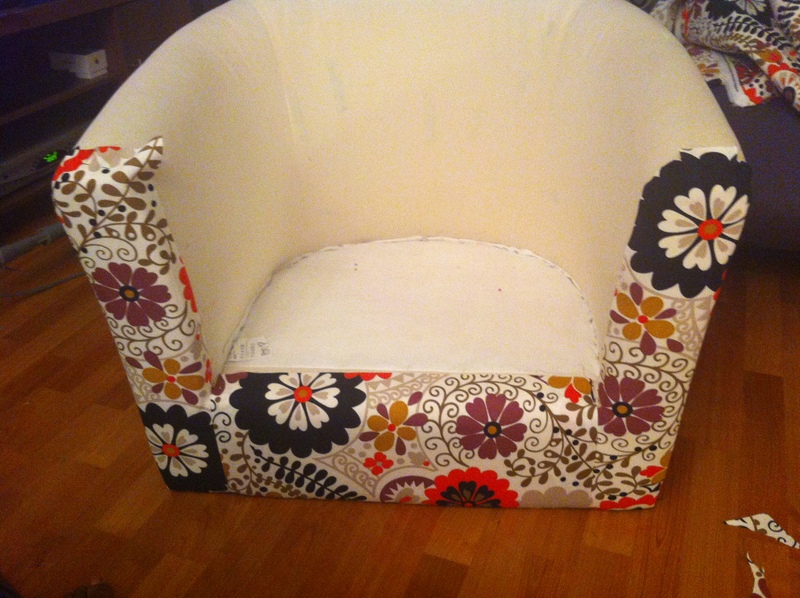 Using only one piece of fabric (the way the sides are done) is quite difficult to lay flat because the back is curved. 2 pieces should be sufficient, but if you’re worried about having a seam right in the middle of the chair, use 3 pieces. Only try this on light-weight furniture. This Tullsta weighs next to nothing, so flipping it over didn’t pose any risk to me. I’ve seen some armchairs that are quite substantial. Turning them upside-down would not be so easy, and you could risk hurting yourself if it falls down on you. Of course, I’m by no means a professional upholsterer and I’m not going to claim that this job will last forever, but it’s a great way to change up the look of your chair with little expense. This idea could be great for a little kid’s room, as you could change the look of the chair to reflect the child’s age and interests. It could also work well with university students, most of which have little discretionary money, and none of which for upholstery. And frankly, it’s works well if you spill red wine or mustard or some other indelible stain. ← How to Break In a Leather Jacket? Nice job. I teach upholstery and would love to re-post this on my site. I’m glad you like it! Yes, feel free to repost. Thanks!! Great post! 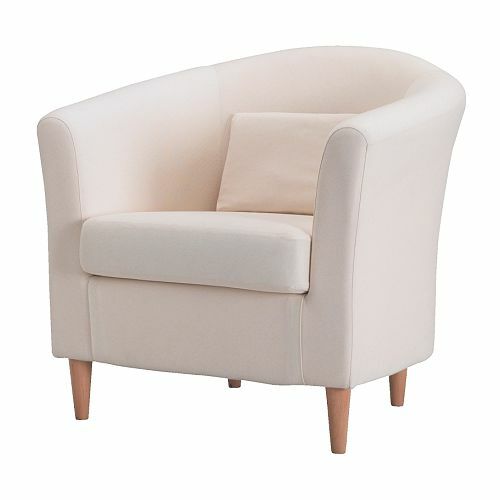 I’m looking to upholster exactly the same chair! How many meters of fabric would you recommend that I buy?? Just reread and saw that you recommended 6 meters. Any chance I can get away with less? I definitely had a bit left over after I was done. So if you only have 5 or 5.5, you’ll be good. I’m glad you liked my post and good luck on your project! Thank you, I’m glad you liked it! I’ll be posting an update soon!